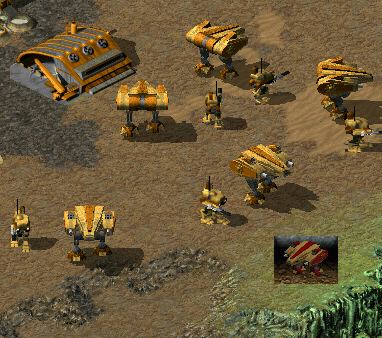 I'm releasing this unit, which was meant to be used in the mod TS: Rise of Omnius. I was really fond of this unit, but not anymore. It made a trip from being a multiplayer unit, to a campaign only unit, and now is out of the mod. The main reason for it, is that RoO has way too much two legged mechs, to stop this I'm going to replace it with a four legged version (with the same purpose), based on one of the discarded designs for the mammoth mk IV. A big, short range missile platform, mounted in two carrier units. Possessing a big amount of armor, the minotaur is a heavy support battle mech with excellent AA capabilities. This mech is very slow in comparison to the Hover MLRS; but it has the same speed as other mechs, making the minotaur a great mobile turret, or a good support unit for ceberus class mechs. Though the shadows use the wrong color, but this is only a 2 second color replace work. I'm not sure, but i have the feeling that different shadow colors slow down the game. Post date is the middle of last year. On the subject of making shps as good, I'd suggest 3Dstudio Max and some tutorials. Well you're not seeing weird things, so don't worry. Anyways the unit works fine ingame, it's a problem with images, you can even see it in this other image. Notice the white dots on the conyard and the titan, which weren't modified, yet, by me at that time. On a side note, I've noticed this since I switched to Firefox 3, I didn't have these problems before. Please do check the post date. I sincerely doubt Machine is still messing with this 3 years later. you should turn on some super-sampling for anti-aliasing although I know that will mess up the team color parts. Has anyone come up with a solution for that yet? Meselfs downsizer does that, but it seems I don't have the little program on this computer anymore. It does force you to render stuff as uncompressed TGAs and, at least, 3 times the inteded size, but it doesn't antialias remap or the background, and automatically aplies the pallette. And as darkstorm said, I'm not messing with this(these) model(s) anymore, in fact it seems they've been lost, not that it matters too much it's been over 4 years since I uploaded this unit, and 3 since my previous post in the thread. By the way, if you're looking for help with finding graphics or something, you'd probably want to post a topic in the base Media Hut forums.